He is also known as “Jammy” but that is because his father worked for Kissan, the Indian jam manufacturer. He is the man whose batting has done much to help India become the No1 Test team in world cricket. We are sitting on the terrace of a Dubai hotel. The Indian Premier League has just finished, England are about to become the World Twenty20 champions and so our chat turns naturally to his Bangalore Royal Challengers team-mate Kevin Pietersen. “He is a very good player, a very, very good player,” says Dravid. But what about criticisms of Pietersen's approach to the game: self-centred and even, at times a bit of a hot head? For Dravid, who was not in the West Indies for the World Twenty20, Pietersen's triumph — he was man of the tournament as he helped to guide England to their first ICC trophy — comes as no surprise. While the two could not be more different, the bond between them is easy to understand. Like Pietersen, Dravid has been driven by a hunger, his being to prove that India could become a power in world cricket and shed its image of tigers at home, yet lambs abroad. “I remember on my first tour of England in 1996 the players discussing that we did not to do well away from home,” he recalls. “It became a goal for some of us to start winning series abroad. That achievement seemed an impossible dream on that June Saturday in the summer of 1996 when Dravid made his Test debut at Lord's. Batting at No7 he could have been mistaken for a tailender. In any event, many Englishmen at headquarters barely noticed him. Their minds, if not eyes, that afternoon were glued to television screens beaming pictures from Wembley where England were beating Spain on penalties in a Euro 96 quarter-final. Although he made 95 before falling victim to the now jailed Chris Lewis, the innings caused little stir. It was a decade later, with Dravid leading the side, that the Indians finally began to get the monkey off their back. In 2006, India won a series in the West Indies for the first time in 35 years and followed it by winning one in England the summer after, the first for over two decades. By then, Dravid had also captained India for their first Test wins in Pakistan and South Africa. “Before 1996, I'd come with the young schoolboys' team to England but had very little exposure to playing abroad,” he says. “I hardly played any Under-19 cricket against other countries. It is typical of Dravid not to mention that he scores more runs abroad than at home with an overseas average of nearly 60. His journey has meant that Indian cricket, barely tolerated when he made his debut, has virtually taken over at the top table. India provides 80 per cent of world cricket's income and the Indian Premier League offers cricketers football-style riches. Like so much in India, it happened quickly just months after they won the inaugural T20 World Cup in September 2007. 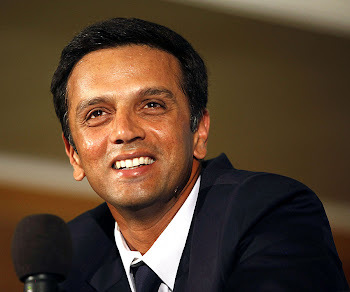 Dravid was not part of that winning Indian team, stepping down from the captaincy after the England tour. Sachin Tendulkar and other senior players also opted out and the word was that Indians did not much care for this form of cricket. Nothing much was expected of the team. But while Dravid is not part of the Indian T20 team he is central to the IPL and has no doubt what it represents. His happiness with the format is enhanced because it has meant that, for the first time in his long career, he has played domestic cricket in front of packed stadiums. After years playing in empty grounds, with spectators allowed in free but attracting not many more when he played for Kent, the IPL is a domestic tournament played to full houses. And Dravid is just as sure the IPL city-based franchises, modelled on the English Premier League, will catch on. One reason given for launching the IPL was the fear that the Indian youth were being seduced by Premier League football. Dravid, himself, is an Arsenal supporter. Partly this was to be distinct from the rest of the Indian dressing room who support Manchester United. “Anybody but United was my slogan,” he says, however he was also drawn to the Gunners by Arsene Wenger's “professorial and intellectual style”. The idea of football-style city-based teams may be novel in cricket but Dravid says: “Given that some of the English Premier League clubs have been in existence for over 100 years, the popularity of these IPL franchises, which have been in existence only for three years, is just terrific. The financial scandal may prove more far reaching. It has seen an Indian government minister resign and Lalit Modi, the creator of the IPL, suspended facing serious charges. As a by product, it could also lead to IMG, advisers to the IPL, suing Giles Clarke, chairman of England and Wales Cricket Board, about allegations he has made regarding Modi and the IPL. Dravid plays this with a dead bat. “There have been issues in and around the management and the administration side of the game, which happens in a lot of sports,” he says. But he does admit that it's hard to say what the long-term impact might be. Yet, for all the achievement of his generation of Indians, the 50-over World Cup remains a hole in their record. Indians have not won it since 1983. With Dravid out of the Indian ODI side it is hard to see how the hole could be filled. At 37 and with a young family he has, he says, no personal goals of centuries or runs to score. His targets are “to win a Test series in Australia or South Africa”. But should next February — when the subcontinent hosts the 50-over World Cup — Dravid return to the side and gains a winner's medal not only would it round off a remarkable career, he could look KP in the eye as the Englishman flashes his Twenty20 medal. one of the best one around and simply a class !